Hey everyone!! 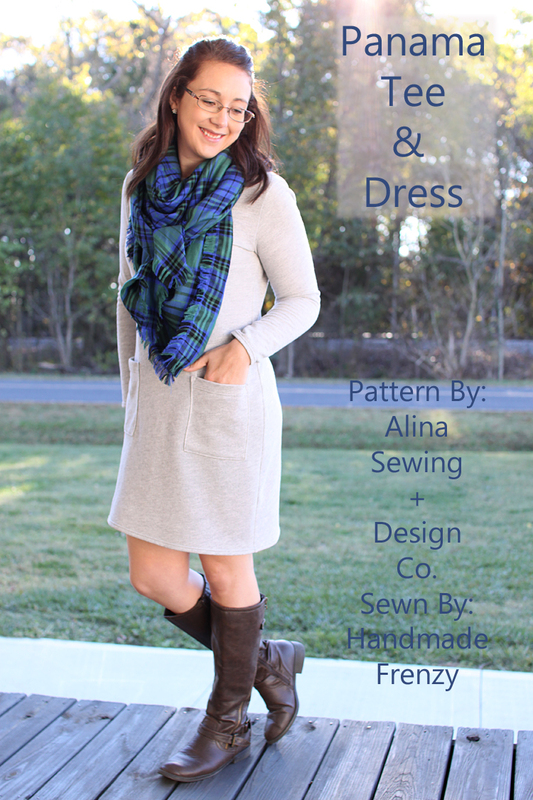 Today I'm celebrating the release of the amazing Alina of Alina Sewing + Design Co's second pattern! 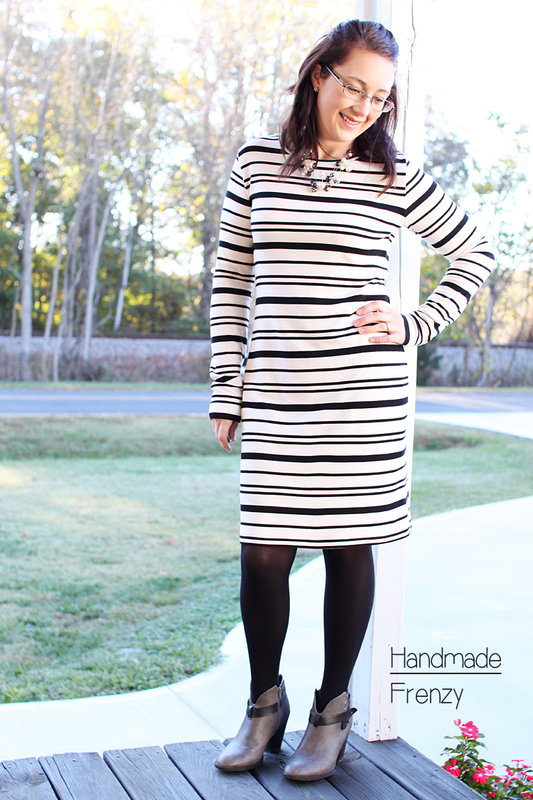 It is the Panama Tee & Dress Pattern, which includes 2 dress length options, a tee and 3 sleeve lengths. And by celebrating I mean, jumping for joy that this pattern is in existence. Both the Chi-Town Chinos and now this dress pattern, are exactly what I wear all day, every day. Having patterns that match what I already wear anyway, is basically just the best thing ever. Not just having the patterns, but having well drafted, high quality and simple to use patterns is everything. I was thrilled to be able to test this pattern and made 2 dresses during the process. 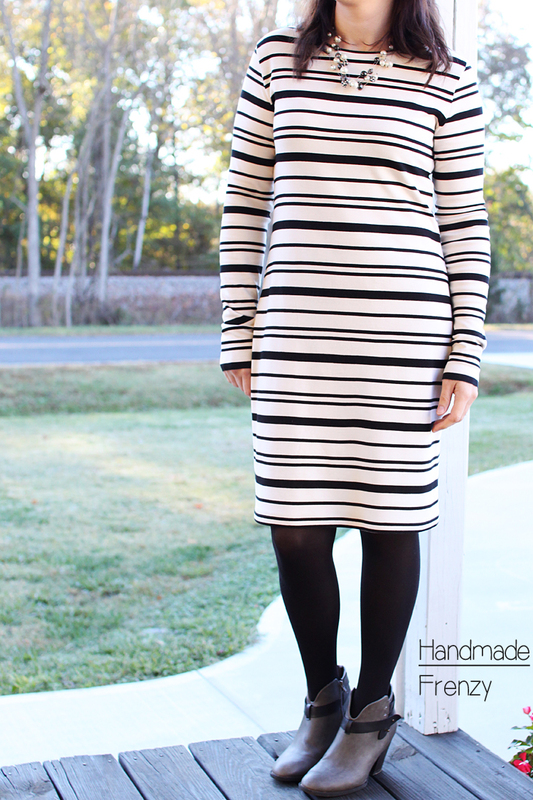 The first dress I made was this striped number. The fabric is a ponte from Imagine Gnats that I've had for a while and I'm pretty sure I bought what was left at the time. She does have some other amazing options at the moment! I made view B with long sleeves. There were a few minor changes made during testing, but what you see here is pretty much a size 6, with no changes whatsoever. The pattern is drafted for a B cup, height 5'2" - 5'7". I am a B cup, 5'3"
The shoulders were narrowed slightly in the final version, and you can see that as well in the second dress I made. Having not made one single change to the pattern with this dress, I knew I had found a sweet spot for myself. My bust and hip measurement fell exactly in a size 6, my waist is slightly bigger (thanks babies and chocolate), but there is the perfect amount of ease there so that no grading between sizes was needed for me. I should mention that I didn't hem the sleeves on this one. I liked the wide black stripe at the bottom of the sleeve and didn't want to lose it, so I left it! I also love the slightly-too-long sleeve length on this one. I love a little scrunch at the end of my long sleeves. Alina includes instructions on how to stabilize the shoulder seams in the pattern. This is something that I have been meaning to start doing on all my t-shirt makes anyway, so the reminder included was awesome! Plus she suggests a few ways to do it, some I certainly hadn't thought of, but now I'm excited to find creative ways to add some fun to the inside of my tees! For the second dress, I made the same view B with long sleeves, but with a few tweaks. 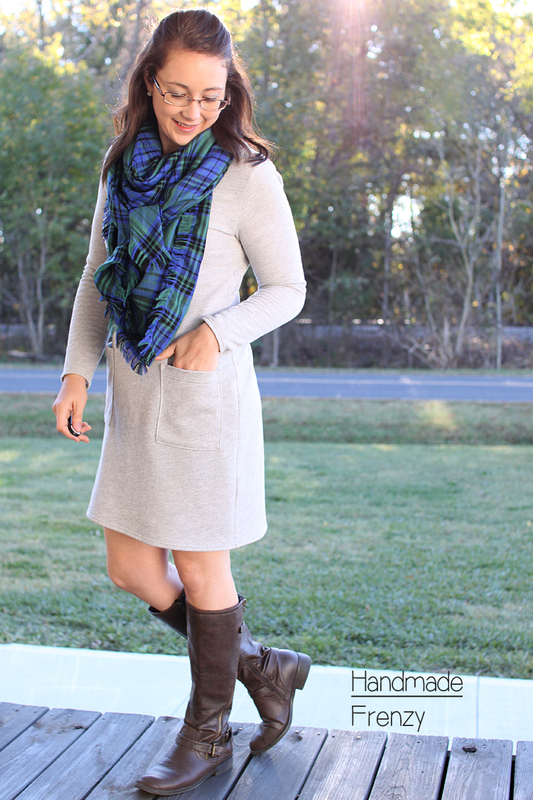 I again made the size 6, but sewed it in a yummy classic heathered gray from LA Finch Fabrics. Because the french terry has a little less stretch than the ponte does, it produced a little closer fit. I also shortened things a bit. I shortened the waist by 1/2", because the hip curve was hitting me just slightly too low. I took another 2 1/2" out of the hem length, and 3" from the sleeves. There is a chest patch pocket piece included in the pattern. I felt like the gray needed just a little something to break it up, but wanted hip pockets rather than a chest pocket, so I just took the rectangular pocket patten and upsized it to fit my hand and then played around with the placement until I found what felt right to me and stitched them on! 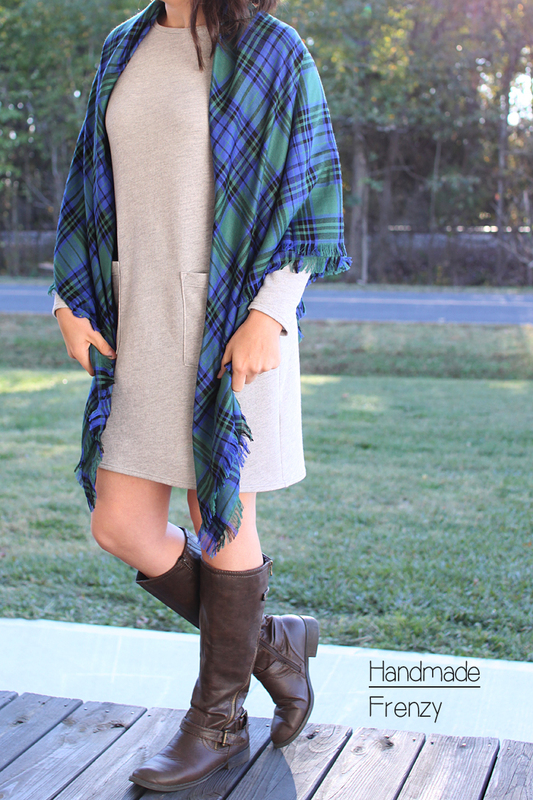 I loooooove this paired with a scarf and boots. If I'm just at home, I'll ditch the boots for some leggings and cozy socks. This is my spirit animal pattern. For reals. I only have about 4 more versions of this pattern that I plan to sew up ASAP, so I'm sure you'll be seeing more of it from me! Go here to grab your own copy! If you want some more inspiration on things to do with this pattern, Alina has an awesome Pinterest board worth checking out! You look awesome! Both are fantastic versions!